L.A.’s legendary Holiday Bowl is long gone, but there will be a chance to revisit it, for a little while, this weekend. Mitchell Matsumura’s “Holiday Bowl” is one of four shorts by Sansei filmmakers that will be presented by Sansei Legacy and Gardena Valley Japanese Cultural Institute on Saturday, Nov. 3, from 1:30 to 4 p.m. at GVJCI, 1964 W. 162nd St. in Gardena. Matsumura — a writer for the Asian American newspaper Gidra and creator of the Facebook community pages Asian Retro and Sansei Legacy — made his documentary, which was screened at the Los Angeles Asian Pacific Film Festival, through Visual Communications’ Digital History program. Though not a bowler, he has fond memories of the Crenshaw District bowling alley and coffee shop that opened in 1958 and closed in 2000. Holiday Bowl was one of a number of Nikkei-run businesses in the neighborhood, which also included the Kokusai Theater. He remembers the bowling alley as a community institution. “The opening of the Holiday Bowl was a big event … Bowling was huge among the Nisei into the 1980s. Every night hundreds of Nisei league bowlers would hone their skills at L.A.’s finest bowling alley with 36 lanes. Among the interviewees were children of the owners, championship bowlers, employees, and people who just loved being there. Matsumura already knew Ken Okuda, son of Harry “Hanko” Okuda, co-founder of Holiday Bowl. “One of the most amazing interviews was with Los Angeles Women’s Bowling Association Hall of Fame inductee Dusty Mizunoue, who also worked at the Holiday Bowl counter for over 30 years,” Matsumura said. In addition, he came across Studio for Southern California History, a nonprofit organization that had already done a lot of research on the subject. For Matsumura, “Holiday Bowl” is more than an exercise in nostalgia. “An important message I learned while making the film was how a huge Japanese American community, Crenshaw, can virtually disappear if it’s not sustained or supported. 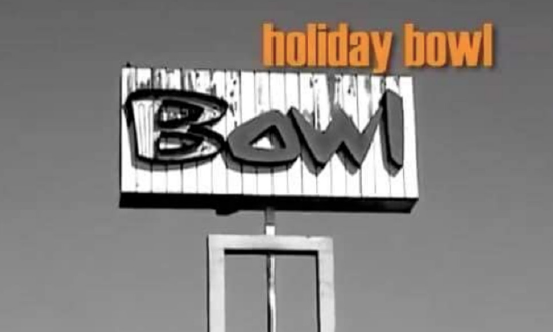 Holiday Bowl closed because of a depressed economy and as Japanese Americans migrated to places such as Gardena and Orange County beginning in the ’70s. By the year 2000, Holiday Bowl closed and the vibrant Japanese American community disappeared. The film showcase will also feature “The Arts District Without Artists” by Steve Nagano, “Jeff Imada: Breaking Barriers by Design” by Cory Shiozaki, and “Say Yes to Your Heart” by George Takaki. Tim Toyama will serve as emcee.